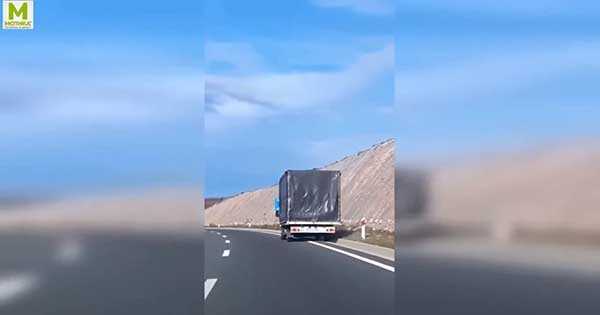 Croatian Truck Driver Having Immense Difficulties Driving In Heavy Wind! - Muscle Cars Zone! Croatian Truck Driver Having Immense Difficulties Driving In Heavy Wind! Every truck driver with a CDL knows how dangerous driving in heavy wind can be. For example, in a state like Michigan, truck drivers need to reduce their speed by a third if the wind is strong. If it gets way too high on the Beaufort scale, then they need to cease driving altogether. Now, when we mention bad weather you probably think about rain, ice and snow. However, there are many other things that can affect a truck driver`s ability to safely operate his/hers semi-truck. One of those things that are often overlooked is Wind. Semi-trucks are more prone to strong wind interference because they are bigger and the wind makes their trailers to move. Strong winds have contributed too many truck accidents over the years. Another thing worth mentioning to why driving with a semi-truck in heavy wind is dangerous is because the trailer`s surface can create a massive “sail area”. This sail area catches the wind and causing massive problems for the driver to overcome. Now in the video below you can see a perfect illustration to this problem. Not long ago, the Croatian town, Bakar, was struck by heavy winds. The force of this heavy wind can be perfectly seen by how much this semi-rig is struggling to keep its wheels on the road. It`s a very intense video that you think every second something very bad is going to happen. In comparison, the regular cars don`t have any problems whatsoever. Nevertheless, we got to give big props to the truck driver for managing to keep his truck on the road. However, here are some advices from drivers how to drive safe on bad weather!